…and, dare I say, its GRANDEST! 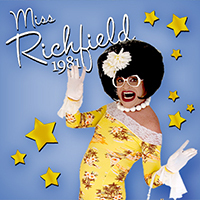 Dedicating her life to the friendly citizens and responsible merchants of her hometown of Richfield, Minnesota, “where butter is a spice and gravy is a beverage”, Miss Richfield 1981 is fast becoming one of America’s national treasures. This Midwestern maven is winning over theater audiences around the country with an interactive format that combines homespun warmth and edgy improv, leaving audiences in hysterics. Her live performances have received critical acclaim with The New York Post declaring Miss Richfield 1981 “the must-see act in Provincetown.” and Twincities.com noting: “In these divided times, Miss R is tonic—and gin—for the soul.” In addition to selling out venues each year in New York, Chicago, San Francisco, San Diego, Philadelphia, Atlanta, South Florida, and Minneapolis, Miss R continues to fill the Pilgrim House in Provincetown, Mass, nightly each summer, and tours with Atlantis Events cruise ships and resorts. Miss Richfield’s national appeal includes riotous appearances on “The Tonight Show with Jay Leno”, “Today” on NBC, “Cake Boss” on TLC, and “Watch What Happens Live” on Bravo. Currently, she is part of the cast of “Talk Show The Game Show” on TruTV, and a television spokesperson for travel company Orbitz. Additionally, she serves as a national brand ambassador for the City of Palm Springs. What makes Miss Richfield unique is the combination of midwestern sensibilities with an off-the-page humor, stemming from her creator Russ King. A former journalist and Minnesota native, King created the character with a rich history that begins with her life-long goal of being crowned beauty queen of her first-ring suburb of Minneapolis. 2015 Richfield Citizen of the Year! An honor I will always cherish. I saw your show in P-town September 2 years ago… it was one of many highlights during my visit. My next visit to the “Cod” will certainly include a visit with you. Dearest Miss R/Russ, Haven’t seen you in long time (don’t worry – I’m not a stalker) – it’s Jeannie ZaiKaner here. My, how we have all changed! My life is really different from those times when we could lay around my living room with impudence, drink wine, talk trash, listen to your stories,,,… I am now my mother’s caregiver, 24/7 with the help of my husband Bob (oh you remember him). My mom is 83 and ok, a little dementia, so we all live together – nothing fancy like diapering anything – although you could probably give med a few tips. So last night I am sitting with my mom watching/enduring my second hour of The Golden Girls, which you know that’s about when it actually becomes funny. And suddenly there you were – on my tv, looking right at me, having the time of your life in Philly – I have since learned that you are everywhere now, spreading your love and wisdom beyond these prairie dog hamlets – Mazel tov, big boy! Your career has really taken off and I am proud to know you and to watch your success bloom and conquer! And by the way, you look FABULOUS! Be cool, be healthy, be a lover!